UK firm Premier Foods has snapped up two iconic British brands in a £70m ($134.3m) deal with US giant Kraft. Seventies favourites Bird's Custard and Angel Delight will join Premier's portfolio, which includes Typhoo Tea. Premier will also take over ownership of other assorted brands, all of which generated sales of £37m last year. Bird's Custard, dating back to 1837 when Englishman Alfred Bird invented the powder, is one of the UK's oldest packaged grocery brands. The company added that the deal would enhance earnings and suited its strategy of acquiring "great British brands with leading market positions". 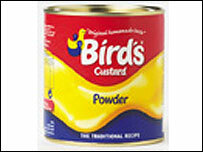 Bird's custard will be produced at a Premier factory in Staffordshire, which will be the subject of a £5m upgrade. The company said that it would be spending about £5m to upgrade the plant, but that the deal would result in cost-savings of £1m once it is completed in February. "The Bird's business with its high brand recognition is a perfect fit with our Ambrosia and other desserts brands," Premier chief executive Robert Schofield said. "It will extend our product range in the desserts category and enhance our position as one of the UK's leading suppliers of ambient grocery products." Bird's - with its Three Birds trademark, which was created in the 1920s - is one of the most recognised brands in the UK. A food and drink survey, carried out in 2000, found 99% of customers recognised the brand, which accounts for 45% of the custard consumed in the UK. Investors welcomed the news, pushing Premier shares 9.75p higher to close at 256.75p.